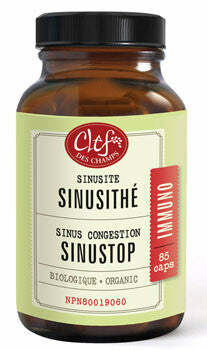 Natural herbal remedy used to ease nasal congestion and soothe seasonal allergy symptoms. Non-medicinal ingredient: Vegetable cellulose capsule. Adults: 2 to 4 capsules 1 to 2 times daily. If pregnant or breastfeeding, ask a health professional before using. Consult a health care practitioner if symptoms persist or worsen. Consult a health care practitioner if symptoms persist or worsen. Consult a health care practioner if you suffer from inflammation, biliary obstructions and/or stomach ulcers. Avoid taking with prescription drugs, including anticoagulants.